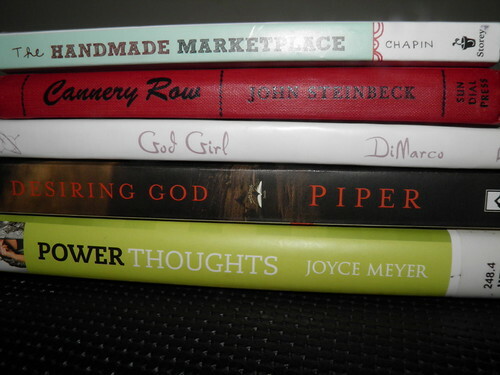 This is what's on my book list lately. Yep, I'm reading them all at the same time. I pick up wherever I left off in the tome that matches my mood that day. It's a terrible habit that I have of starting too many books at one time. I'll put books on hold at the library at the same time that an Amazon order arrives at the doorstep and the Bible study starts a new book. Aye! Thankfully fall is a great time to refresh the bookcases, because there's plenty of dark time to enjoy a few hours of reading. 1. Handmade Marketplace: I've been toying with the idea for awhile of starting an Etsy store. This book is great for goal-setting and branding a craft store. 2. Cannery Row: A friend lent this Steinbeck classic to me. It's great because the chapters are short and they jump around. So, I can pick up where I left off easily. Steinbeck's descriptions are expert!!! 3. God Girl: This is actually meant for the younger lady, but I love it anyway. It's so soft and sweet and makes God feel like your best friend. It's fresh not to be so serious and in-depth once in awhile. 4. Desiring God: I've mentioned this one before. Apparently, it's a Christian classic that's regaining ground again. I love love love the idea of finding or re-living pure joy in God. 5. Power Thoughts: This is the Christian response to the Law of Attraction movement that's shaking the ground right now. It puts thoughts into a Christian perspective. Yes, you can use your thoughts for great things, but you can't "think into being" your favorite house or a million dollars. So helpful for not getting caught up in all those materialistic concepts. I almost added more to this stack, but I had to stop somewhere. Inevitably, a few will go half-read once the library demands their books back. A book like Desiring God cannot be inhaled in one night. It's meant to be savored and re-visited for a quite some time. Thankfully, some are short enough to be completely read within a few more days. Happy Reading!